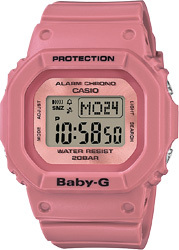 The LOV-18B-4 consists of the G-Shock DW-D5600LF-4(left) & Baby-G BGD-560LF-4(right). 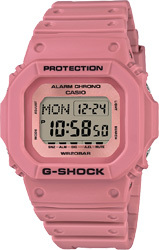 Base models are the popular DW-5600 and BGD-560, colored in antique pink. The theme of this year's models is "Love is tough," and this G-SHOCK and BABY-G combination has been designed to express the strong bonds between Cupid and Psyche in never-ending love, despite the many hardships facing them. Pressing the light button causes the silhouette of wings to appear in the backlight. The left wing is Cupid's wing, while the right wing is an image of Psyche's butterfly wings. The back covers of these models sport a gold ion-plated finish to commemorate G-SHOCK's 35th anniversary, and are stamped with images of an angel and a devil, along with the year 2018.